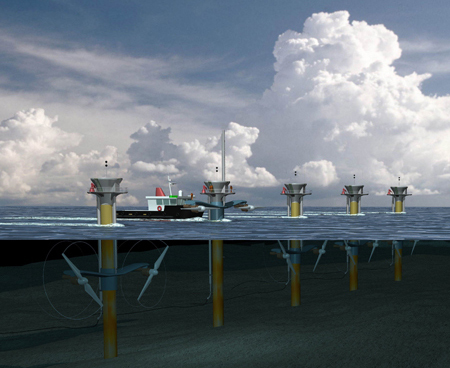 Offshore Turbine is like an underwater wind farm. 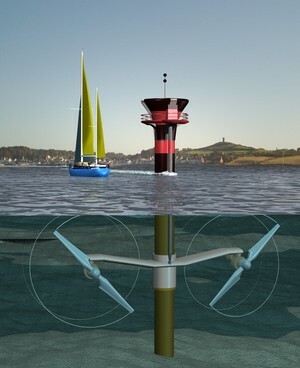 Tidal turbines work much like submerged windmills, but driven by flowing water rather than air. They can be installed in the sea at places with high tidal current velocities, or in places with fast enough continuous ocean currents, to take out copious quantities of energy from these huge volumes of flowing water. This has the advantage of being much cheaper to build, and does not have the environmental problems that a tidal barrage would bring. Which was installed in May 2008 by Marine Current Turbines Ltd is both first mover and world leader in its field. The prototype is operational in Strangford Narrows , Northern Ireland. SeaGen uses the most efficient type of turbine rotors, namely axial flow pitch controlled rotors, the technology of choice in the wind industry. As such SeaGen's rotors can achieve over 48% efficiency over a broad range of current velocities and they also offer complete control over the machine - it can be shut down in less than three seconds even with the current at full flow. More details follow. SeaGen is by far the largest and most powerful tidal turbine in the world with 16m diameter twin rotors each sweeping over 200 square meters of flow. These rotors used to develop a rated power of 1.2MW at a current velocity of 2.4m/s. Each rotor driving a generator via a gearbox much likes a hydro-electric turbine or a wind turbine. These turbines have a patented feature by which the rotor blades can be pitched through 180 o in order to allow them to operate in bi-direction flows – that is on both the ebb and the flood tides. The twin power units of each system are mounted on wing-like extensions either side of a tubular steel monopole some 3m in diameter and the complete wing with its power units can be raised above sea level to permit safe and reliable maintenance. The system is accredited to OFGEM as an official UK generating station and regularly runs at full rated power. It has the capability to deliver about 10MWh per tide, which adds up to 6,000MWh per year. This is approximately the rate of energy capture that a wind turbine of about 2.4MW rated capacity can typically produce. So SeaGen shows that the tides are not only more predictable than wind but twice as productive. Marine Current Turbines next project is for a 10.5MW tidal energy farm off the coast of the Welsh island of Anglesey in a fast flowing patch of 25 meter deep open sea known as The Skerries. Marine Current Turbines will take forward the project as a joint venture with npower through a newly created development company, SeaGen Wales Ltd. Subject to successful planning consent and financing, the tidal farm could be commissioned as early as 2011. The scheme will consist of seven 1.5MW SeaGen turbines, each likely to stand approximately 9 meters above sea level. Previous independent scoping studies have identified the Skerries as an ideal location for a tidal stream project, due to its favorable tidal conditions and natural shelter. The location benefits from good port facilities at Holy head nearby, proximity to the National Grid facilitating good connection, and good transport links and access, to facilitate construction and maintenance. Swan turbines design is different to other devices in a number of ways. It works like an underwater wind turbine. The video shows a turbine being installed offshore. It turns into the current to accept flow from any direction. It is continuously adjusting for maximum efficiency. The installation and yawing system are part of Swanturbines core intellectual property. The most significant is that it is direct drive, where the blades are connected directly to the electrical generator without a gearbox between. This is more efficient and there is no gearbox to go wrong. Another difference is that it uses a "gravity base", a large concrete block to hold it to the seabed, rather than drilling into the seabed. Finally, the blades are fixed pitch, rather than actively controlled; this is again to design out components that could be unreliable. Timeline: The route to market is a structured programme of demonstration and investment which began in 2000. Current activity is the build of a 300kW demonstration machine to be installed later this year. The first commercial sales are expected in 2014.